Daniel Midson-Short, May 2018 - You’ve probably heard the expression ‘you could get hit by a bus’. It’s a strangely morbid phrase that denotes that anytime, anywhere things could take a wrong turn. 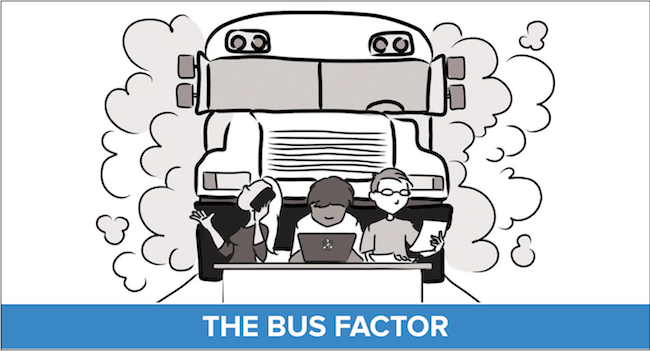 The Bus Factor is a measurement of the risk resulting from information and capabilities not being documented or shared among team members. When it comes to managing your dental practice, the ‘hit by a bus test’ can help to ensure that your business is actually running well. Ask yourself, can you (or anyone in your practice) be absent from your practice for a short or extended period without the place falling apart...? Are you the ‘everything’ person in your practice? Every practice has one person who ‘does everything’ or ‘knows everything’. But what if that person quits, goes on holiday or *gasp*… gets hit by a bus! Imagine the chaos that could come from having all the knowledge and information disappearing. This is where the systems of your business are essential. If you are in a position of leadership, your true role is to empower others to grow and develop themselves, while also creating success for your practice. Do you have systematic approaches in place for each team member? Every practice is run differently, and regardless of whether a team member is experienced, or a fresh employee, having documented systems allows everyone on the team to be performing at peak efficiency. Furthermore, systems in place allow for a methodical approach when reviewing room for improvement to how a practice can be better run. So why then do most practices risk the bus factor? Of course, there are always excuses as to why it is easier to just keep doing everything yourself. But of course, doing everything yourself limits how much you can actually do. Here are three excuses a lot of practices use to avoid training their team. This is the most commonly used excuse by most principal dentists, practice owners and practice managers who are too busy doing everything! They are fighting fires and trying to prove they are productive. Yet their lack of trained team means that they have no support. So, they end up doing everything themselves and feeling frustrated that nothing improves. A common pitfall that usually occurs more so with most dentists is that they often assume nobody is as competent as they are. This really comes down to the ego and trying to be seen as important. Yes, you as the dentist are an essential part of the team, but so are the other members. Seeing their ability to be competent, and committing to their training is a way to free yourself; so that you can do what you do best – providing the best possible care for your patient. Some dentists feel like because they’ve had bad experiences in the past with a team member that they shouldn’t bother training the newer ones. It may be that a previous team member didn’t make the effort. Or maybe they left after the dentist invested in them. Whatever the case, the new team members deserve the chance to be trained. If you empower a team member and invest in them, they are more likely to rise to the task. Everybody wants to feel valued. This is often why most dentists, practice owners, and practice managers hold onto doing everything in the practice. But ironically, this behaviour is somehow worse for the practice than doing almost nothing. Nobody wants to get hit by a bus, but the lack of systems and training for your team may actually be a worse reality. Find out more about how you and your practice can effectively put systems in place and survive the bus factor.